This simple savory stuffed acorn squash is easy to make and filled with the wonderful flavors of Fall. The stuffing is made with farro, chicken sausage, mushrooms, celery, onions and sage – you’ll love this! 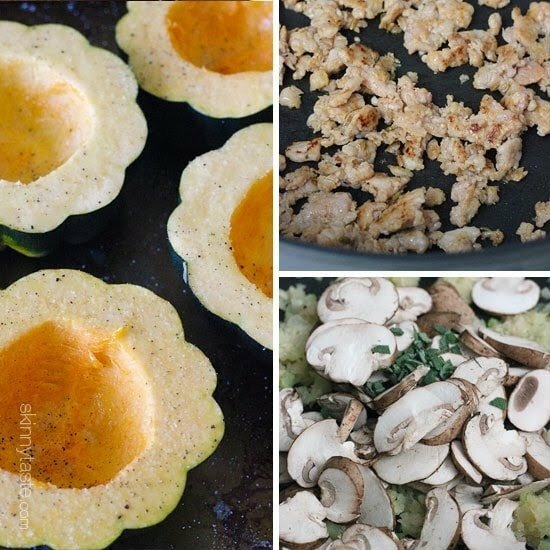 I love roasted acorn squash, it’s the perfect edible bowl you can fill with whatever you can dream up! This Turkey Chili Stuffed Acorn Squash is a great example! Here I used chicken sausage and farro, brown rice would also work great. And it’s so easy, simply halve and hollow out acorn squash, then season with salt and roast in the oven. Nothing like warming up the kitchen on a blistery night with baked squash in the oven. While that bakes make the stuffing on the stove, then when the squash is ready fill it with the stuffing and serve – the results are a soft, flavorful squash filled with savory goodness! This stuffing is an adaptation of this brown rice and sausage stuffing, one of my favorites, which you could of course use instead of farro. I’ve also made it with barley and it was wonderful. Farro is a delicious ancient grain, it’s chewy, nutty texture which holds up perfectly in this stuffing, but farro does contain gluten so if you want to make this gluten-free, swap it out for brown rice. Makes a great weeknight meal or a nice addition to your Thanksgiving table. Simply eat with a spoon to scoop out all the wonderful squash with the stuffing in every bite – enjoy! Mist the cut side of squash with olive oil and season with salt and pepper. Place in a baking dish and add 1/4 cup water to the bottom of the pan. Cover and bake 50 minutes. Uncover and bake an additional 10 minutes. Remove from oven and allow to cool before serving. Meanwhile, cook farro in chicken broth according to package directions. While the farro is cooking, in a large saute pan cook chicken sausage on medium heat, breaking up the meat into small pieces as it cooks until the sausage is cooked through and is browned. Set aside on a dish. Add olive oil to the pan and add the onion, sauté 1 minute, add the celery, salt and pepper to taste; cook until celery is soft, about 8 to 10 minutes. Add the mushrooms and sage to the pan, more salt and pepper if needed and cook, stirring 5 minutes, then cook covered for 2 minutes, or until the mushrooms have released their juice and are cooked through. Return the cooled sausage and the cooked farro to the sauté pan and mix well. 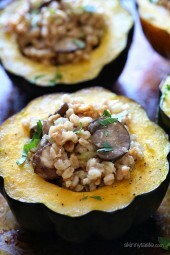 Divide the farro stuffing evenly between the roasted acorn squash, garnish with parsley and serve. Just finished making the stuffing and omg it’s delicious! I can just imagine how good it will be with the squash. The only change I made was to use turkey sausage because it was what I had on hand. I will definitely make this again! Just made this tonight and it was a HIT! I’ll do it again for sure. Thanks Gina! Made this for thanksgiving and it was delicious!! What about placing the stuffed squashes back into the oven for awhile? Should I lessen the baking time beforehand? Would a short period at high temperature be preferable to a longer time at 350 degrees? I can’t find sage leaves in my small town, how much powdered sage would you use? I used 1 tsp of poultry seasoning, in place of the sage. It’s a great recipe. Thanks! This is one of my all-time skinnytaste favorites! My husband is a vegetarian so I make 2 versions of this, one with a vegetarian italian sausage. He loves it! I also use vegetable broth and quinoa instead of the Farro. It is a perfect fall/winter dish, an amazing comfort food. It makes really good leftovers too! This recipe was a winner! We used chicken apple sausage instead, perfect for us. My leftovers for lunch we're even better. Great salty/sweet combo. I look forward to every new post, thanks! Hi! Would you roast the squash cut side up or down? I just made this and it was awesome, I didn't have any sage or parsley so I add about a cup of baby spinach at the end when you mix farro in with sautéed veggies and I added some grated parmesan cheese after that. I finally made this last night. It was delicious. My kids ate it and even my picky husband. Next time though I believe I will scoop the squash out and just mix it with the stuffing. The stuffed squash made a beautiful presentation, but unstuffed was easier to eat. 🙂 Thank you for all your recipes! Do you remove the casing from the sausage or just finely dice it? I put some chopped walnuts in and it was terrific! Thanks for the inspiration. I didn't read all the reviews, so this may already have been said…Freekeh is a low-gluten green wheat and could be used here. Similar to Farro and Barley, with a nutty chew. I have to acorns in the bin now, and all the other ingredients laying around too…just have to decide between the Farro, Freekeh or Barley! THanks! There is NOTHING like roasted squash. It’s like God gave it to us with the intention to roast it and would have slapped us upside the head if we hadn’t figured that out. Because really, raw squash is pretty nasty. Love the color in the photos! gina, this is SO tasty. my husband and I loved the salty sweetness of the stuffing and the acorn squash! MANY THANKS for your ridiculously tasty beautiful healthy recipes and pictures! Made this Saturday, it was delicious! I absolutely love farro and have been trying to find more ways to use it! Thanks for a great recipe! Made this last night. It was so good! If I made this for thanksgiving, and made the stuffing the morning of – should I 're-fresh' the stuffing with a little chicken broth? Any other suggestions to make it feel like it came right out of the kitchen? You can make the stuffing the night before, then roast the squash the day of and heat the stuffing when ready. Gina, another amazing recipe! You always get me to try new stuff (like quinoa…use it all the time now). I tried to find farro, but my grocery store didn't carry it. So, I sub'd brown rice. Also, it was the first time I had ever cooked acorn squash. Oh my…it was so yummy with the dressing. We will definitely be making this many more times. I have been following you for several years, and make your recipes regularly. Thank you and God bless!! Brilliant! I could eat this everyday and never get tired of it! This looks so delicious!! Do you think it would ruin the taste if I left out the mushrooms? I hate the texture of mushrooms so I try to leave them out whenever possible! PS – I love all your recipes – they're the only healthy ones my husband doesn't get nervous about when I tell him I'm making them for dinner! I made your butternut squash lasagna recipe recently and right after he ate it he told me he was really nervous about it but ended up really liking it! I think it would be fine Allison. Had the ingredients on hand and made it tonight – delicious and now part of the repertoire! These look perfect for Thanksgiving! These look so good they almost look fake! I'm going to veganize with veggie sausage, Field Roast has a few varieties that are all awesome. I think the Apple Sage would go great with this. I really like the quinoa suggestion in an earlier comment too, I'm a sucker for quinoa. Can't wait to try it! This looks so good! I just walked to work in a 9F windchill and and frozen. Something warm and winter-y sounds like just thing tonight! Thank you! Do you think quinoa would work in place of the farro? I have everything here to make this, except that. My husband doesn't like brown rice. Sure, I've made the stuffing with quinoa as well. what is a acorn squash Gina Im from down under Australia what can I use?? You can use any type of squash, pumpkin or even butternut. 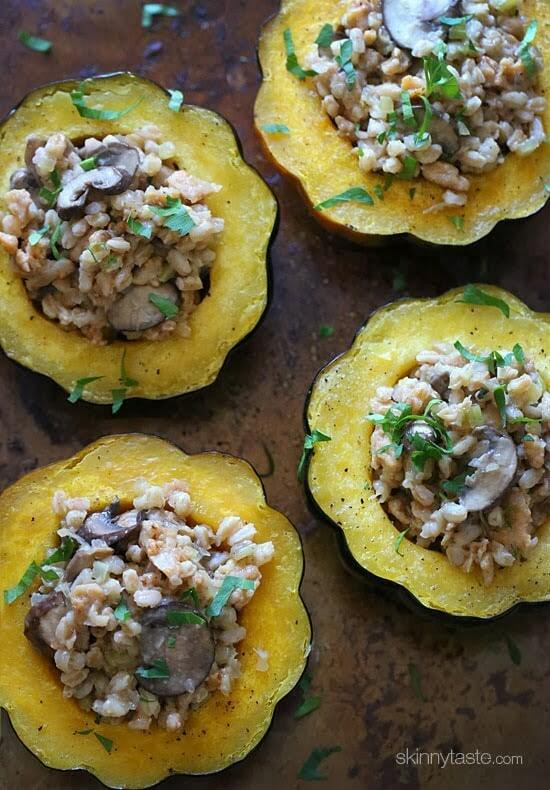 I have acorn squash from my CSA box and just bought some farro & mushroom – I know what I will be having dinner soon 🙂 Can't wait to make this! That's amazing! Can't wait until I cook this, thanks for sharing! Ciao,il tuo blog mi piace moltissimo;come posso tradurlo in italiano?Grazie,Lisa. This looks SO good. I have acorn squash in my garage, I am thinking I will go to the store this weekend to get the ingredients to make that delicious looking stuffing. I have never had farro, but I am all about nutty, delicious grains so I think I will love it. I've also never had chicken sausage…I guess I need to live a little. Can't wait to try this. I LOVE your site. If you can't find farro, any whole grain such as barley or brown rice would work. Would this store well for leftovers throughout the week? It would be fine refrigerated 2 to 3 days. Would you wrap and store the cooked squash and the stuffing separately, and then assemble and reheat the whole thing in the microwave? It's just me, and I'd like to adjust to make just two servings, with leftovers for the lunch the next day. Sure, that would work perfect. This looks really fancy!! I love all your recipes because they make me look like quiet the chef!! 🙂 <3 I can't wait to try this! I don't have chicken sausage near me, can I use any other kind of sausage? I can't wait to try this! I'm going to sprinkle goat cheese on top to replicate a similar dish I had in a restaurant years ago – yum!! Yum! The points are low enough that you could totally splurge with cheese! this looks amazing Gina. So good had to share it on my facebook page too! I'm not a big fan of squash, do you know the calorie count of the farro & sausage stuffing by itself? Do you think quinoa would work as a substitute for farro? Yes, I've done it with quinoa too, although I like the farro better but it's still good! I was just going to e-mail you about making a stuffed acorn squash recipe, you read my mind! I'm making this today!